This week I finished Mapping IV for my series of female portraits exploring the connection between the physical world and the mind's reality. This one focuses on memory. I drew the hippocampus, amygdala as well as a neuron with its cell, axons, dendrites and terminal buttons. I monoprinted a leaf and drew a cross-section of galvanized wire rope and added dripped watercolors. interesting combination of abstract and the real, definitely piece to be look at more closely. visiting from sunday sketch, hope you have a wonderful day. Fascinating art today! Happy Sunday! Wow! Fascinating and elegant sketch ~ ! What amazing topic--exploring the connection between the physical world and the mind's reality!! That's a study and creative study too that could last a lifetime. 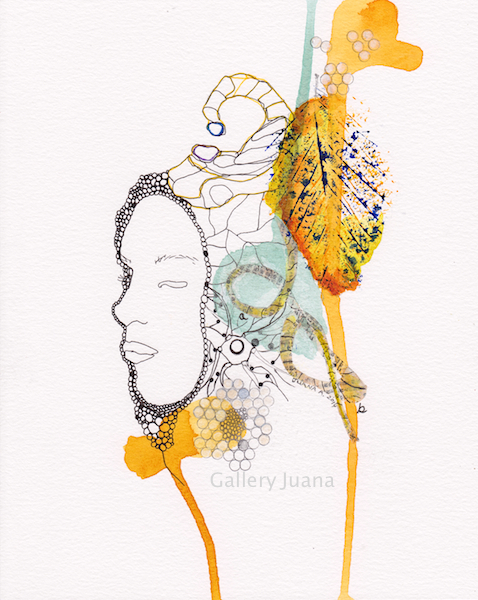 :o) LOVE your mix of materials and all the different shapes in your sketch, Juana. This feels so big and expansive--just like the mind!